The Chester County Astronomical Society was formed as a non-profit organization dedicated to the education and enjoyment of astronomy for the general public. The Society holds meetings (with member or guest speakers) and observing sessions once a month. Anyone who is interested in astronomy is welcome to attend meetings and become a member of the Society. In addition to the monthly meetings and observing sessions, the Society also provides a variety of services to the public, including astronomy classes as well as telescopes and expertise for "star parties" for school, scout, and other civic groups. Saturday, April 6, 2019 - CCAS Special Observing Session at Hoopes Park, West Chester, PA. The observing session starts at sunset. The session is from 8:00 p.m. to 9:30 p.m.
Tuesday, April 9, 2019 - CCAS Monthly Meeting, Room 113, Merion Science Center (former Boucher Building), West Chester University. The meeting starts immediately after at 7:30 p.m. Guest Speaker: West Chester University professor Dr. Marc Gagne. Friday, April 26, 2019 - West Chester University Planetarium Show: “Your Backyard Sky,” in the Schmucker Science Building. The show starts at 7 p.m. and run approximately one hour in length. For more information and reservations, visit the WCU Public Planetarium Shows webpage. Friday, April 26, 2019 - CCAS Monthly Observing Session, Myrick Conservancy Center, BRC. The observing session starts at sunset. The session is from 8:15 p.m. to 9:45 p.m.
Saturday, April 27, 2019 - CCAS Special Observing Session with the Atglen Public Library at Wolf's Hollow County Park, Atglen, PA. The session is from 8:15 p.m. to 9:45 p.m.
Friday, May 10, 2019 - CCAS Monthly Observing Session, Myrick Conservancy Center, BRC. The observing session starts at sunset. Tuesday, May 14, 2019 - CCAS Monthly Meeting, Room 113, Merion Science Center (former Boucher Building), West Chester University. The meeting starts immediately after at 7:30 p.m. Guest Speaker: Dr. Chris D'Andrea, astronomy professor at Haverford College. He will be presenting a talk entitled "Supernovae: Going Out with a Bang." Saturday, May 11, 2019 - National Astronomy Day. CCAS Special Observing Session at Anson Nixon Park, Kennett Square, PA. The observing session is from 8:00 p.m. to 9:30 p.m.
Saturday, May 25, 2019 - CCAS Special Observing Session at Welkinweir, Pottstown, PA. The observing session starts at sunset. Friday, June 7, 2019 - CCAS Monthly Observing Session, Myrick Conservancy Center, BRC. The observing session starts at sunset. Saturday, June 8, 2019 - CCAS Special Observing Session at Bucktoe Creek Preserve, Avondale, PA, from 8:30 to 10:00 p.m. The event is open to be public but registration for non-CCAS members is equired through The Land Conservancy for Southern Chester County website. A small fee is required by The Land Conservancy of Southern Chester County to attend this event. Friday, July 12, 2019 - Friday Night Lights with the Natural Lands Trust - this is a fund raiser for the Natural Lands Trust where music is provided. Several local astronomy clubs are setting up telescopes for the concert goers to view the night sky during the event. If you are not a member of CCAS you must purchase tickets from the at Natural Lands Trust. CCAS members who want to assist with the astronomy portion of this event must bring a telescope or mounted astronomical binoculars to qualify for free admission. Members must contact Don Knabb by June 9th. Friday, July 26, 2019 - CCAS Monthly Observing Session, Myrick Conservancy Center, BRC. The observing session starts at sunset. Saturday, August 3, 2019 - CCAS Special Observing Session at Hickory Run State Park, White Haven, PA. The observing session is from 8:00 p.m. to 10:00 p.m.
Thursday, August 22, 2019 - CCAS Special Observing Session at Starr Farm Park in Downingtown, PA. The session is scheduled from 8:00 PM to 9:30 PM. For star parties and astronomy events near you, visit http://nightsky.jpl.nasa.gov/. Learn about all of NASA's missions at http://www.nasa.gov/. The society schedules monthly observing sessions in the Myrick Conservation Center of the Brandywine Red Clay Alliance. The observing sessions, which are planned around the new moon, are open to the public and announced in the Society's newsletter, Observations. Owning a telescope or binoculars is not required; anyone interested in observing the heavens is welcome to show up. If you do have a telescope and need help using it, our observing sessions are a great place to practice and learn from other society members. The Chester County Astronomical Society's regular monthly meetings include a presentation from an invited speaker or the demonstration of an astronomical project by one of the Society's members. After the presentation, a brief business session is held to review the status of society activities. Meetings typically last 1-1/2 to 2 hours including an informal conversation over refreshments before the start of each meeting. The Society meets at 7:30 PM the second Tuesday of each month in Room MER112 in the Merion Science Center (former Boucher Building) at West Chester University (corner of South Church Street and Rosedale Avenue, West Chester, Pennsylvania). Click for Directions and Maps. CCAS has partnered with Chester County Night School to offer a six-week program meeting Monday nights at Ruston High School from 7:00 to 8:00 PM. The classes run from March 18, 2019, through April 29, 2019, with no class on April 22, 2019 (the day after Easter). The cost for the courses is $59.00 per person. Star Parties & "Nights Out"
The Chester County Astronomical Society offers "nights out" to interested organizations including local schools, scouting groups, and other civic groups for the purpose of learning more about the heavens. For example, scouting groups often hold them to earn badges for their members. If your organization is interested in hosting a "night out", please contact us. Saturday, April 6, 2019 - CCAS Special Observing Sessionat Hoopes Park, West Chester, PA. The observing session starts at sunset. The session is from 8:00 p.m. to 9:30 p.m.
Star parties are national and regional events similar to "nights out" and open to the public. They are held throughout the year. For a list of upcoming national events in 2019, visit the star parties page. The West Chester University Department of Geology & Astronomy hosts a planetarium show open to the general public on the 2nd Friday of each month. 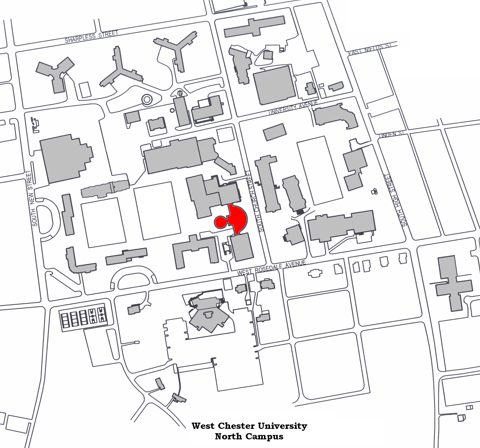 The WCU Planetarium is located in the Schmucker Science Center on Church St. To locate the planetarium, view the campus map. The shows start promptly at 7:00 P.M. ET and run approximately one hour in length. Late arrivals will not be permitted to enter the planetarium. Each show includes an overview of what is visible in the current night sky and a special focus on some aspect of astronomy. Reservations are required because the planetarium has limited seating. For contact information, visit the WCU Public Planetarium Shows webpage.